The dollar surged against its peers yesterdau and most Asian markets tumbled after the Federal Reserve indicated it will likely embark on a steeper path of interest rate hikes over the next year. While the decision to lift rates had been a certainty, a plan to hike them three times rather than the expected twice jolted trading floors. The news sent the dollar soaring well past 117 yen and its highest level since February, while it also bulldozed other currencies, particularly higher-yielding, riskier, units and those of emerging market nations. “This is flat out hawkish, and the US dollar is reacting accordingly,” Stephen Innes, senior trader at OANDA, said in a note. “I thought we would be calling (Fed chief Janet Yellen’s) bluff this morning, as the market had expected at most a subtle shift in Fed language. In Asian trade the greenback pushed towards 118 yen and jumped more than one percent against the Australian and Canadian dollar while their New Zealand counterpart was almost two percent down. The Mexican peso also tumbled. 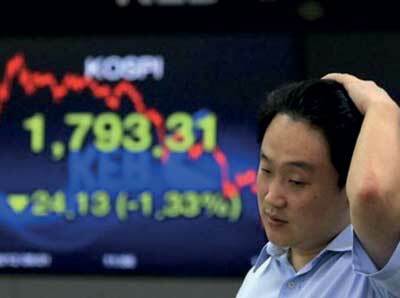 The dollar was also up 0.7 percent on the South Korean won and 0.6 percent versus Indonesia’s rupiah. The Thai baht, Malaysian ringgit and Singapore dollar also suffered heavy losses. In her post-announcement conference, Yellen said the rise was a reflection of “the confidence we have in the progress that the economy has made and our judgment that that progress will continue”. However, the upbeat outlook for the key driver of global growth was unable to comfort Asian traders worried about a flood of cash out of their own economies as dealers look for better returns in the US. Hong Kong sank 1.8 percent, with property firms hammered. The city’s monetary policy is linked to the US and its de facto central bank on Thursday followed the Fed lead to raise interest rates, feeding worries about its already struggling economy. Shanghai lost 0.7 percent as traders fret about further outflows of cash, with China’s foreign exchange reserves already being hammered by attempts to support the yuan which is sitting at an eight-year low against the dollar. Sydney was 0.8 percent lower and Singapore 0.9 percent. Manila was 0.7 percent down while Taipei, Kuala Lumpur and Wellington were also sharply lower. Seoul was flat. However, Tokyo was up 0.2 percent -- heading for a ninth successive gain -- as the weaker yen provided support for exporters. The decision also led to sharp increases in the yield of 10-year US Treasury bills, while gold -- a safe investment in times of uncertainty -- fell almost two percent to $1,140. රේට් වැඩි කරන එකත් කරන්න අමාරුයි. මිනිස්සුන්ගේ ආයොජන අඩු වෙලා ඉතිරිකිරීම් වැඩි වෙනවා. එතකොට ආන්ඩුව හිර වෙනවා. සමාජවාදී රටකටනම් පුලුවන් ණය අරන් ආයෝජනය කරලා බිල්පත් ණය ගෙවන්න. ඒත් ඇමෙරිකාව ?